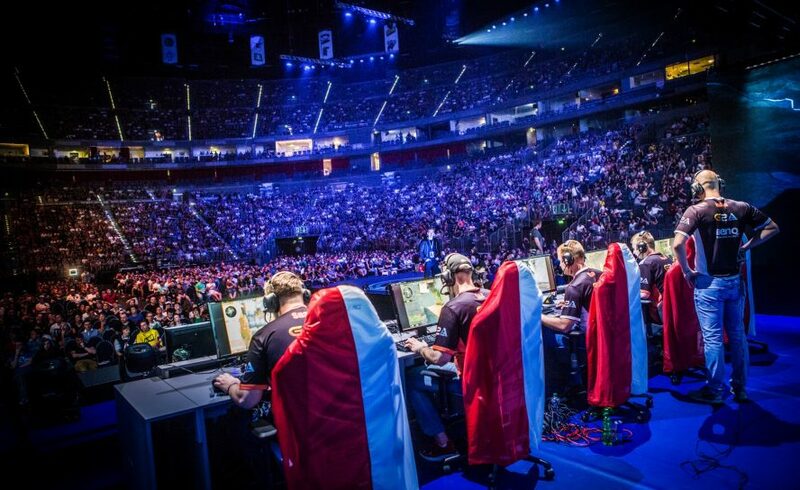 It’s sport “gym” but not as we know it…the ever-increasing rise of eSports is starting to have a real economic impact. This week, Epic Games, maker of the immensely popular cross-platform multiplayer game Fortnite, announced that it will provide $100 million in prize money for Fortnite competitions in its first season of competitive play which is set to start later this year. This unprecedented prize pool will immediately put Fortnite among the most lucrative eSports games, with only one title having had more prize money awarded during its lifetime as a competitive game so far. 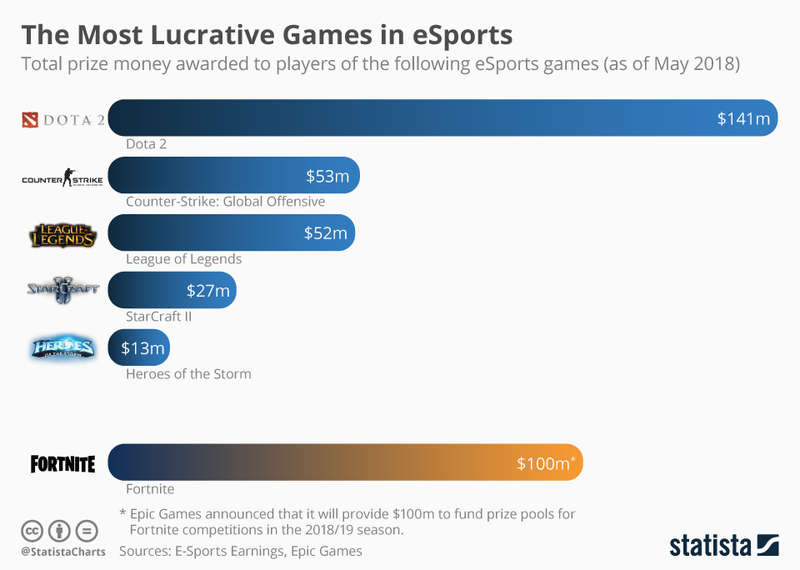 As the chart below clearly illustrates, Dota 2, a game that has been around for years, has drawn total prize money of $141 million, edging out second-placed Counter-Strike: Global Offensive by a huge margin. In recent years, eSports events have become bigger and bigger, with the largest tournaments awarding prize money on par with the largest “real world” sporting events. 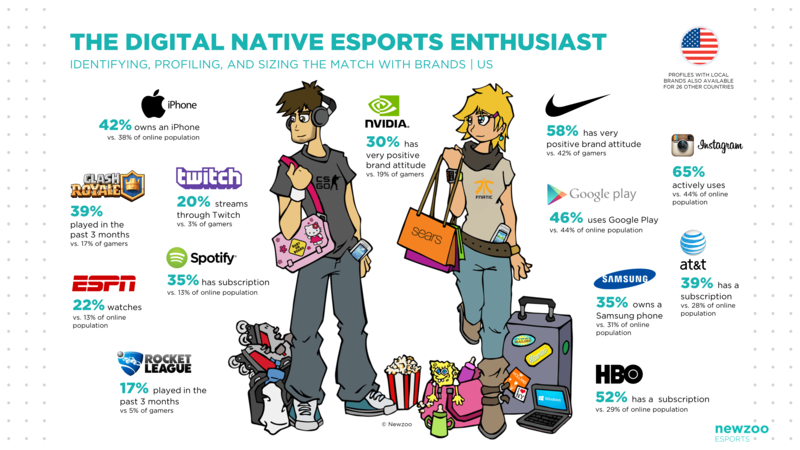 The reason for this trend is rather simple: with millions of video game enthusiasts watching, eSports events draw advertising revenues and sponsorship deals the same way other sporting events do. And just as in professional sports, an increase in sponsorship and TV/advertising money is reflected in the potential earnings of the players/athletes. So is this the future of sports? On a recent trip to Tokyo, I was reliably informed by a number of sporting bodies that the focus of many young Japanese children had moved from traditional sports to mobile devices and console games. This was seen as a real challenge in terms of new participants to sport that in turn, impacted on those watching live events, either in venues or at home. And as I started to review the data from other countries around the world, I quickly noticed that this was a trend repeated almost everywhere. In the UK, although London hosted one of the most successful Olympic Games of recent times, within 3 years of the event, the enthusiasm appeared to have tailed off and over a quarter of a million people had stopped taking part in regular activity. In terms of viewing figures, only last year, data based on the Broadcasters Audience Research Board (Barb) showed that Premiership Football audience numbers across Sky and BT Sports dropped up to 6 percent on previous years, recording the biggest overall decline since records first started in 2010. In Australia, ratings for one-day cricket were also tumbling faster than English wickets on an Ashes tour and previous blue-ribbon events such as the British Open Golf and Formula 1 both continued to fall in what has been a steady erosion of audiences. Even US sports are not immune with NFL showing a year on year decline and baseball also struggling to make the numbers it once commanded so successfully, whilst Nascar figures were so bad they don’t even publish them anymore! So what conclusions can we take from this information? There is an argument to suggest that a majority of these sports now sit on pay-per-view channels, placing them out of the reach of many people. In a time when household budgets seem constantly squeezed, viewing sport may be seen as a luxury. The same could be said of live events, with tickets for this year’s Champion’s League Final in Kiev selling on one resale site for £14,000! I believe the real issue is that younger audiences’ tastes are changing. The immediacy of new technology, delivering everything from data to entertainment at the press of a touchscreen means expectations have shifted. Most people under the age of 30 – the Millennials that marketing executives the world over now obsess about – want something different. Something instant. Sport is hard work – and so it should be. To make it to the top demands dedication, commitment and time. For some Millennials, used to moving a life experience from the moment to a social media post in seconds, anything that takes longer than typing 140 characters is probably just not worth the effort! It simply doesn’t register on the “immediate gratification” scale. There’s no need to spend thousands of pounds on equipment and dozens of hours a week putting your body through torture at the gym. All you need is a £200 console and the latest copy of FIFA to be in with a chance of hitting the big time. And that is probably one reason why eSports viewing is on the rise and the prize money up for grabs is increasing so dramatically. I’ll let Messi and Ronaldo do all the hard work and I can reap the rewards of using their gaming equivalent characters to carve out my own career path in the virtual world. Of course, in reality, it isn’t that easy – true success at eSports requires just as much investment as conventional sports – but as more of what we do moves from the physical world into a digital one, it’s surely only a matter of time before the lines between the two become less and less defined. Decades from now, the true sporting gladiators of the 21st Century could very well be teenage “couch potatoes”!